We begin our review with a cause and effect timeline of the Revolutionary War (1775-1783) based on the cascade of facts that drove colonists to rebel against the mother country. This timeline chronologically begins in 1763 and illuminates conflicting philosophies of the combatants free of the myths that time and distance commonly highlight. Each action promoted a reaction; clearly identified the parties to the conflict, and set the stage for the responses that drove the Americans to war. After your review of this timeline, we call your attention to the additional links located below this table detailing the decisive elements of this war. British Parliament enacts Repressive Legislation and Actions Unexpected Colonial rejections begin an unintended chain of events. 1763 Proclamation prohibiting colonial expansion to Appalachian Mountains boundary. Desired to keep settlements close to Atlantic coast to retain mercantile control. Secondarily, pleased Indian tribes. Largely ignored by speculators and pioneers. 1764 Sugar Act intended to provide Britain with an import duty, and additionally limited overseas markets for colonial lumber. 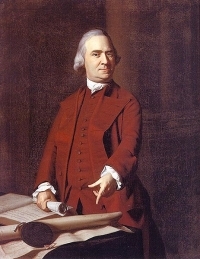 Colonial resistance mainly limited to economic arguments, but signaled an appearance of Samuel Adams, a robust critic of Empire colonial policies. Currency Act prohibited colonists to issue paper money and insisted they utilize British hard currency. The colonial currency system produced a devaluation of its currency which was onerous for British merchants forced to accept the paper money for goods shipped to the colonies. Colonial merchants were at a disadvantage owing to short supply of gold and silver. The latter required by the Act for trading. 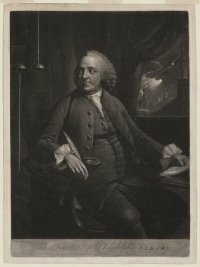 Benjamin Franklin, in London, sought repeal of the law. Colonial Committees of Correspondence began circulating slogan, “no taxation without representation”. 1765 Quartering Act was in response to the financial burden of maintaining a large contingency of troops in the colonies as a result of their earlier use in the French and Indian wars. Colonists were forced to pay soldiers upkeep and board. The burden fell most heavily on the colonial cities which were home base for most of the British troops. In particular, New York City staged hostile demonstrations. Minute Men Anti-Stamp Act Flag Stamp Act required that almost all printed materials in the colonies bear an official stamp. This was a direct tax affecting all colonials payable to the Crown. 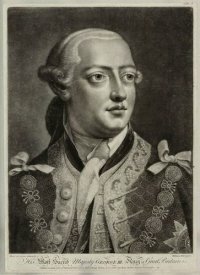 Many of the colonies local legislatures petitioned King George for repeal of the tax. The Sons of Liberty, a patriotic organization, were vehemently opposed citing the right of representation for all Englishmen. 1766 Repeal of Stamp Act and replaced with Declaratory Act affirming Parliament’s right to tax the American colonists. Stamp Act deemed unenforceable as we march further along the Revolutionary War timeline. Colonial entreaties for repeal were aided by Edmund Burke and William Pitt, members of Parliament. 1767 Townsend Acts were imposed on the American colonies for the purpose of enhancing revenues for the Crown and providing enforcement mechanisms for all of its taxing programs. Resistance in the colonies resulted in garrisoning British forces in Boston. Ultimately repealed in 1770 except for duty on tea. 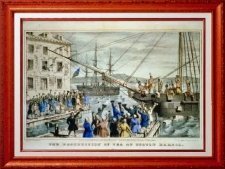 The five provisions of the Act met with demonstrations by angry mobs, boycott of British products. 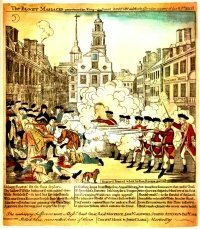 1770 Boston Massacre followed on the heels of the death of a young boy killed by a British official. Angry Boston mobs needed little incentive to harass British soldiers. A mob surrounded a British sentry. Subsequently, he was reinforced and allegedly the troops were subjected to stone throwing by colonists. British fired into the crowd killing several including a runaway slave, Crispus Attucks. This act was so indelible in the Revolutionary War timeline that his name will again surface to be memorialized by abolitionists in the civil war. Eight British soldiers were tried and successfully, and surprisingly, defended by John Adams. 1773 Revolutionary War timeline continues w/ the Tea Act. Some duties were reduced but monopoly to sell to colonies bestowed on East India Company. Tea shipment destroyed by colonists boarding British vessel wearing Indian disguise. 1774 Intolerable Act restructured Massachusetts government; restricted town meetings. 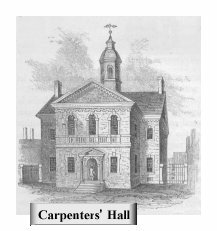 Boycott of British products.First Continental Congress convenes. Boston Harbor closed. Talk of independence surfaces. Don Troiani British General Gage marches his troops from Boston to nearby Lexington intent on destroying colonial guns and munitions. Then march to Concord. Patriot forces forewarned move most of military equipment to safety. Superior in number, British troops defeat colonials at Lexington, but suffer defeat in Concord. Battle of Lexington signals the opening shot of the American revolutionary war leading to replacement of Gage with General Howe. British in Boston seek high ground held by Americans near Bunker Hill. Americans engaged in battle show mettle in loss. No longer a colonial rebellion, but two nations in a defacto war. Responding to military pressure and further British coercive legislation resulting in embargo on American goods, American reaction is swift. Another nail in the causes detailed in the Revolutionary War timeline Americans see the handwriting on the wall, and Second Continental Congress confirms George Washington as commanding general of 14,000 soldiers.He is dispatched to Boston, and leads successful siege against British who abandon the city and retreat by sea. 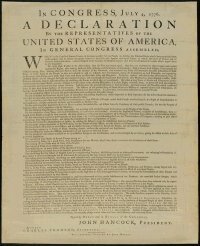 1776 Congress confirms Thomas Jefferson’s masterwork, the Declaration of independence on July 4, 1776. The Revolutionary War is now between two nations - no longer a rebellion of colonies. Every American war was defined and illuminated by thousands of moving parts. In a sense, a war machine is like a huge wheel designed to advance a strategy, a goal, but inherently capable of sudden stops and reversals. You may examine the wheel and its component spokes (links) that propelled the American war machine, all trans-formative, and the human hands that created the turns and pivots that marked this war and our times.